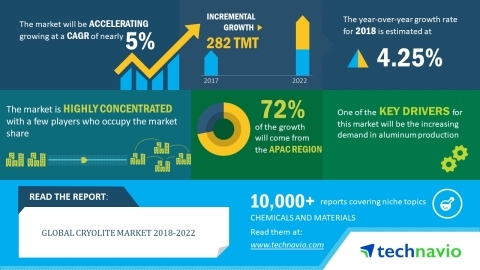 Technavio analysts forecast the global cryolite market to grow at a CAGR of nearly 5% during the forecast period, according to their latest market research report. The rise in demand for lightweight materials is one of the major trends being witnessed in the global cryolite market 2018-2022. Aluminum is used in various industries such as the automotive and electronics owing to its lightweight material. The weight of a vehicle is directly proportional to the amount of energy required to move it. The efficiency and performance of a vehicle depend on its weight. The use of lightweight materials instead of heavy materials leads to a reduction in the weight of a vehicle, thus improving fuel efficiency. In the aluminum production, cryolite is used as a flux by aluminum smelters Adding aluminum fluoride and cryolite to the production process of primary aluminum lowers the consumption of electricity required in the smelting process and thereby considerably contributes to the reduction of production costs of aluminum. Cryolite has become one of the most commonly used compounds to produce aluminum through molten salt baths due to its electrolytic properties. The global cryolite market research report provides market segmentation by application (aluminum production, ceramics, and glass) and by region (the Americas, EMEA, and APAC). It provides an in-depth analysis of the prominent factors influencing the market, including drivers, opportunities, trends, and industry-specific challenges. The aluminum production segment held the largest market share in 2017, accounting for nearly 63% of the market. This application segment is expected to dominate the global market throughout the forecast period. APAC led the market in 2017 with a market share of 68%. This region is expected to dominate the market through 2022.